Interested in learning how industry leaders from around the globe are designing their products and building simulation applications? 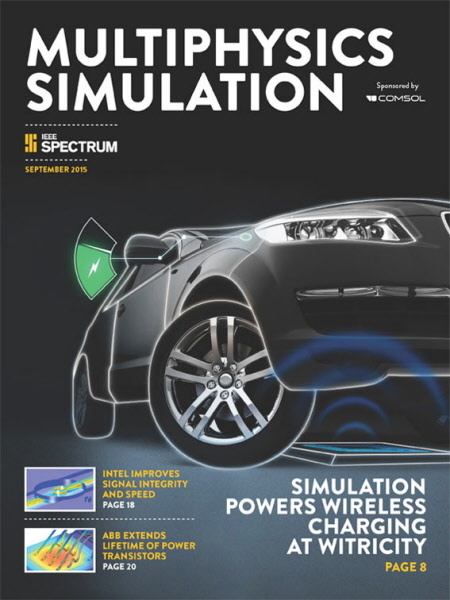 The latest edition of Multiphysics Simulation offers a behind-the-scenes look at innovative simulation projects within companies such as WiTricity, where engineers are revolutionizing wireless power transfer, or how the R&D team at Cypress Semiconductor is utilizing simulation apps as a new line of communication between the modeling experts and the rest of the production team. You can read all of the customer success stories by clicking on the magazine cover, or simply download the PDF version. Cover image courtesy of WiTricity.